DSD, and the derivative forms of DSF and DFF, are gaining popularity in audiophile circles. While they benefit from higher sampling rates than audio ripped from or for CDs, they face the same library management challenges when stored as computer files - issues around metadata management, cover art completion and more. We added support for DSF to bliss in April and this brought with it support not only for the usual metadata consistency rules, but also album art finding, fixing, resizing and all the usual good stuff! What is DSD and DSF? DSD was an audio format that came out of the Super Audio CD standard almost two decades ago. Since then, and with the move to computer based audio, DSD audio has been stored inside DSF and DFF files. I wrote a little more about the differences between DSD, DSF and DFF here. Assuming you have DSF files, you will have the same requirement for cover art that the users of FLACs, WAVs or MP3s (shudder!) have. 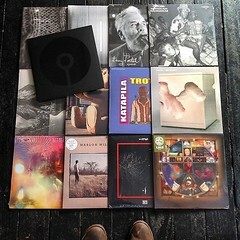 Album art makes your collection easier to navigate and browse. First we'll need to point bliss at the DSF files. This is the folder in which all your DSF albums are stored. Next to Music location either type in the location, or click Browse to find the library. 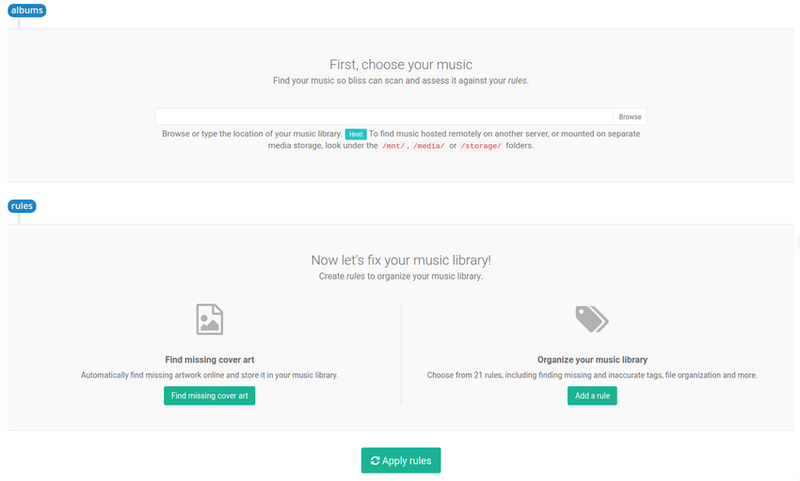 If your music library is stored on the network, read this. The Saved artwork name determines the name of an additional artwork image file stored in the same folder as each DSF album. The best filename to choose for this depends on a few things but generally "folder" or "cover" is best. If on Windows, I'd suggest "folder", so Windows Explorer reliably uses it for the image for the folder. If you want to embed artwork inside the DSFs ( I always recommend this), make sure to choose Embed art where possible. You can also click more to further refine the artwork that is found and assessed by bliss. You can choose minimum and maximum sizes, and more. Remember that bliss will also assess the existing artwork in your collection. If you already have artwork, it will be assessed that it complies with, for example, your sizing rules. Unless you choose to overwrite automatically, however, the existing artwork will not be overwritten. 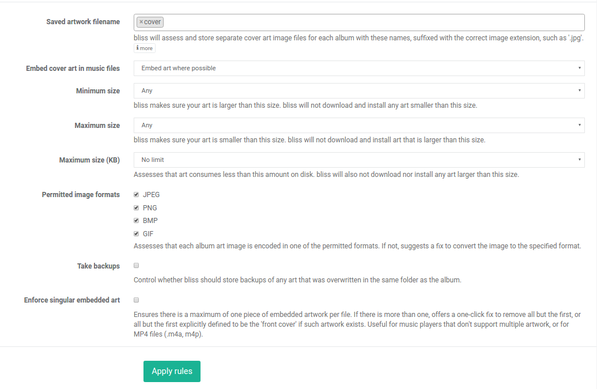 bliss will add all albums it finds, regardless of its file format ( DSF is just one of the file formats that bliss supports). All albums are treated the same. You'll see the result of the assessment, once assessment of a given album is complete. 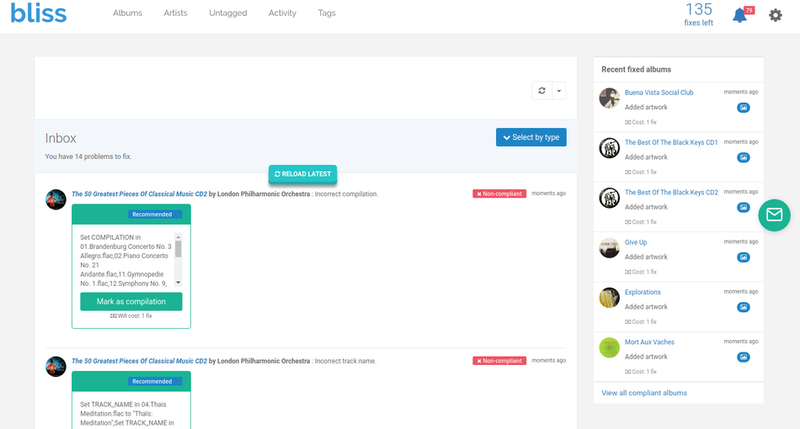 Artwork installation into a artwork-less album is a fully automated process, so you may find bliss will assess, find artwork is missing, automatically find the correct artwork, install it, then re-assess and mark the album as compliant all in one step. Phew! For such albums you can click the missing art hyperlink. This takes you to the Change cover art page where you can choose from some alternatives found by more lenient online queries. 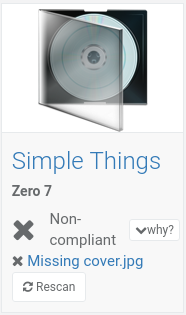 If you have a number of such albums, the fastest way of choosing alternatives is by combining the Cover art alternatives view and a compliance filter. You can also click the Activity page to see what bliss has done, and which albums it has installed artwork for. I hope this helps you find your DSF album art quickly and easily! Thanks to astrangelyisolatedplace for the image above.